There are different reports on the distinctive green painted finish of late-war JAAF propellers. Shown here are some of them. Munsell 10 GY 3/2 is the colour recorded by Ichiro Hasegawa from the recollections of Tadamitsu Watanabe as depicted in Model Art 284. Kenji Ishikawa disagrees with this interpretation. 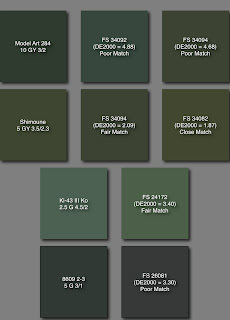 Munsell 5 GY 3.5/2.3 is reported by Noboro Shimoune as the late-war prop colour for the Ki-84, Ki-87, Ki-43 III Ko, Ki-94, Ki-100, Ki-102 and Ki-106 aircraft. Munsell 2.5 G 4.5/2 is the colour reported in Model Art 395 specifically for the Tachikawa-built Ki-43 III Ko prop from information provided by Tachikawa Chief Designer Kenichi Oshima and Tachikawa sources. It is a paler, brighter green than the Shimoune swatch. Munsell 5 G 3/1 is the dark greyish-green paint of swatch 2-3 recorded in the 8609 Feb '45 joint IJN/JAAF paint consolidation document.